CEATEC has always been renowned for its showcasing of new products in the field of robotics and this year was of no exception, with Intel and the CEO of Japanese company Cyberdyne showing off the HAL robot walker and revealing how it will change the world of medicine, gaming and exercise. TechRadar was in Japan to see the demo of HAL where we were told how it works. It essentially links up to the signals the human body gives off and enhances everyday human functions, like walking. On stage we were shown the machine in action and it's impressive, if a little scary. It is all run by a computer strapped to the back of the Walker which, unsurprisingly, has Intel inside. 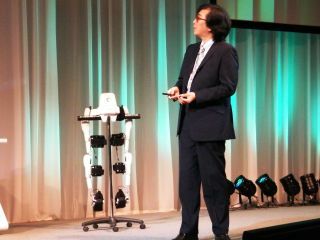 Yoshiyuki Sankai, CEO of Cyberdyne, came on stage and said about the HAL walker: "This is the first robot suit in the world called HAL – using the human signals it is possible to operate robots. "It amplifies or enhances humans – you can link the suit to the internet and it can be used with games machines. "Hal not only uses robotic technology but neuro-science, sociology and biology." While gaming may sound like the thing that would make the robot suit awesome – imagine it linking up with Kinect – it also works in the medical world. "Advanced technologies [within HAL] can be used for sensing vital signs for health management," said Sankai. "It uses neuro nerve technology and monitors human health – you can look at the density of blood in the brain and body [from the system]. "In There is a route that connects the brain and the body and we tap into this with HAL." TechRadar was shown a case study of HAL working in the medical industry and how it helped rehabilitate a patient, just a day after brain surgery. "After brain surgery a day later, HAL was used to rehabilitate, within five days walking training could be carried out and then within two months, massive leg movement was possible," explained Sankai. Cyberdyne isn't a company that is limited to Japan, Sankai explained that there are now offices in Germany and in Sweden, so we may well see the HAL robot walker in Europe at some point. That's if we want to see it. The combination of the words HAL and Cyberdyne fill TechRadar with absolute fear but, as it looks like it has come from mind of Wallace And Gromit, we're more at ease for the tech to reach the UK.